Upon hearing about Stacey’s Red project (link in previous post, I’m a lazy blogger today but hey, I’m blogging again), I checked the stash. I have a lot of sock yarn so I was sure I would have something suitable there. 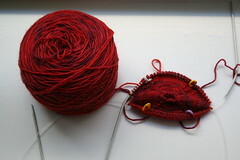 Surprisingly enough, I didn’t have any mostly red sock yarn in the stash. Yesterday after work I headed to my most local LYS. It’s not my favorite, but it is the most convenient location for me. My big pet peeve about it is that you can’t tell what anything costs! This yarn, for example, was in a bin marked “Sock Yarn $8.95” but it was not $8.95. Luckily, I assumed that but I bet there are a lot of people who aren’t real happy when they get to the check-out. Anyway, I got the yarn and cast on last night. It’s a superwash wool. I have the label around here somewhere but can’t put my hands on it right now. Reds are really hard for me to capture with my minimal photography skills, but this is red with some wine/purple color mixed in. It’s purple without being too girly, which is good. I love it so far and hope I can get at least a couple of squares finished before the project ends! Yay for mindless square knitting! I think that shade of red is gorgeous! Thanks Sarah! I don’t really have a firm deadline…so keep on knitting and send what you can 🙂 I need this blanket to be big enough to comfortably cover my Dad. Thanks for the reminder. I have to finish my red square, too. Stacey is great – I’m so glad everyone is helping her out like this. What a great gift.